Home Audio and Home Automation, how does it work? With a fully Integrated & Automated Home anything is possible! Home Audio and Home Automation is the area which brings together all of the various layers and systems to deliver simple control of your home, using easy and intuitive interfaces. Push button keypads, smart remote controls, in-wall touch screens, i-pads, or your PC, can all be used as controls for your home, with a consistent, easy to understand interface. We can integrate all your technical items to work as one. Sometimes just playing a Bluray or streaming a movie can be a task on its own to select the right devices and make sure they are all doing what they are suppose to do. Now with one press of a button you can be watching your favourite movie or listening to your favourite music throughout the house, things can really be made that simple, this is why we call them smart homes for smart people. A keypad by your bed could be set to turn the whole house off, switch off your alarm, or light the way to the bathroom. A screen in your kitchen could show you who was at the gate, what the kids were up to in the pool, as well as select your favourite dinner music. 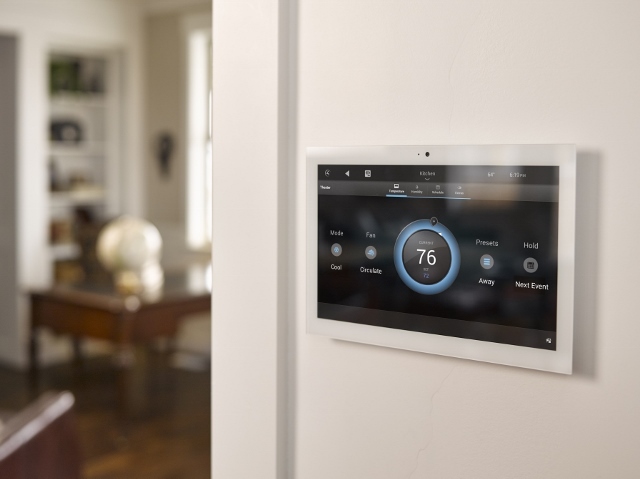 Managing your home from a Control 4 wall mounted touch panel. With automation, your irrigation, outdoor lights and even towel-rails can be scheduled for the seasons, and run automatically. One touch commands can set the house into holiday or party mode, making entertaining a breeze. Security, entry and lighting systems working together means a secure home with easy access for you and your guests. Finally, the promise of smart homes can be delivered, with every system in your house acting as one.